Today at the “Extraordinary Exoplanets” press release (which could righty be called “Extreme Exoplanets”), there were three very interesting and very distinct discoveries announced. William Welsh announced Kepler-34b and Kepler-35b, two new circumbinary planets from the Kepler team. John Johnson and Phil Muirhead presented three new sub-Earth sized planets orbiting an M dwarf. Finally, Erik Mamajek showed us the first ever transit of an extrasolar “ring” system. Remember Kepler-16, when Kepler announced the discovery of “Tatooine,” a planet orbiting two Suns? Well, William Welsh has just introduced us to two new of these so-called circumbinary planets, Kepler-34b and Kepler-35b. Both planets are gas planets, roughly Saturn-sized. Kepler-34b orbits two stars similar to the Sun (making it more like Tatooine than Kepler-16, which orbited two smaller, redder stars) while Kepler-35b’s host stars are somewhat smaller. Both systems are very far from us, at distances of roughly 5000 light years. Was Kepler-16 just a fluke? No, with these two new planets, Kepler has established a new class of planets. Artist's conception of the three small, rocky planets surrounding KOI-961. Image from NASA/JPL-Caltech. 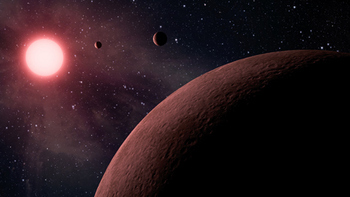 John Johnson announced the discovery of three new tiny planets orbiting a small star, which they found in the publicly released Kepler data around Kepler Object of Interest (KOI) 961. Like many other transiting planets, these three orbit very close to their host star and so are quite hot. The planets have radii 0.78, 0.73 and 0.57 times the radius of the Earth – the last is roughly the size of Mars. The system, which is 40pc away, is similar in scale to Jupiter and its moons. The thing that made these planets detectable is that their host star is an M dwarf. The radius of this star is less than 0.2 times that of the Sun, making the transits of smaller planets more detectable than if they orbited a larger star. With this comes an added difficulty. Small stars like KOI-961, while ideal for detecting exoplanets, are a bit of a mystery: their masses and radii are not well-determined. Since inferring the planetary radii relies on knowing the stellar radii, it was impossible to determine how big the exoplanets orbiting KOI-961 were until the astronomers figured out how big the star itself was. There were two keys to determining the size and mass of KOI-961 (and thus the sizes of the three transiting planets). The first was amateur astronomer extraordinaire Kevin Apps. The second was Kevin noticing that KOI-961 is a near-twin to Barnard’s star, which is a well-studied M dwarf with an interferometrically measured radius. They accounted for small differences between Barnard’s star and KOI-961 using theoretical models and an M dwarf metallicity relation calibrated by Barbara Rojas-Ayala. Having now determined a radius for the star KOI-961, the researchers found that the three orbiting planets were quite tiny indeed. Johnson ended with a choice quote: “Planets are like cockroaches” – when we’ve seen one planetary system like this, we know there are more out there. Artist's conception of the new ring system in front of its host star. Image by Michael Osadciw/University of Rochester. Eric Mamajek showed us the transit of an extrasolar ring system, the first ever observed. This research used archival photometry from two small programs dedicated to finding hot Jupiters: SuperWASP and ASAS-3. These teams made their data public and Mamajek and his team ran their stars through the data reduction pipeline, thinking they might be able to find rotation periods. But what they found was a complex, bizarre looking transit that blocked 95% of light at the transit minimum. This transit was seen in both data sets. Though Mamajek calls this transiting system “Saturn on steroids,” the astronomers aren’t sure what’s inside the rings. How massive is the companion presumably obscured by the rings? How bright is it? There are other questions as well. In Saturn’s rings, shepherd moons create gaps; what is causing the gaps in this system? Is there evolution of the rings? A big question is: What is the orbital period? Only one transit (in 2007) has been observed and although the researchers have searched ten years of archival data, they haven’t found a second one. Great article on the ring transit. Totally missed by other astro websites. Thanks! The press conference was quite full of exciting results so I’m not too surprised most folks jumped right to the Mars-sized exoplanet – that’s kind of a tough one to pass up!